In many ways, Late Registration feels like just a really good sequel to an already classic movie. The premise, the motifs and social commentary is familiar. Kayne’s honest story-telling is still present, as he analyzes health care, drug trafficking, income inequality and religion– all mostly in the context of the black American community. There are enough major improvements from College Dropout to set Late Registration as one of the best in Kanye’s catalog. Late Registration is the second studio album by American hip hop artist Kanye West, released on August 30, 2005, by Roc-A-Fella Records. The production is notably more lush and elaborate than College Dropout. By collaborating with Jon Brion, West was able to utilize production styles and instruments not commonly associated with hip-hop music. More intricate sampling methods and the inclusion of string arrangements meant that the production featured on the album was unique. The album included five singles, all of which also produced music videos. Late Registration also spawned a live album called Late Orchestration, with Kanye performing songs from his two albums backed by a seventeen-piece all-female string orchestra. Late Registration won a Grammy for best hip hop album of the year and was nominated for album of the year. Continuing from College Dropout, Late Registration is structured with short skits between certain songs. The fake Bernie Mac character is back to serve as the condescending authority figure as well as a fictional fraternity composed of poor black students called “Broke Phi Broke,” which West fictionally joins in the album. While these add to the general cohesiveness of the album in some respects, you’ll likely skip them after a so many plays. After College Dropout, who would’ve expected Kanye’s follow-up album to open with a track featuring Adam Levine? “Heard ‘Em Say” features the Maroon Five lead singer in what many have called a hip hop lullaby. Levine and West first met on a plane. West played Levine some demos on his iPod, which prompted Levine to begin work on writing a chorus for the song. The simplicity of the song’s main line, “Nothing’s ever promised tomorrow today,” is what fans love about Kanye’s soulful approach to songwriting. 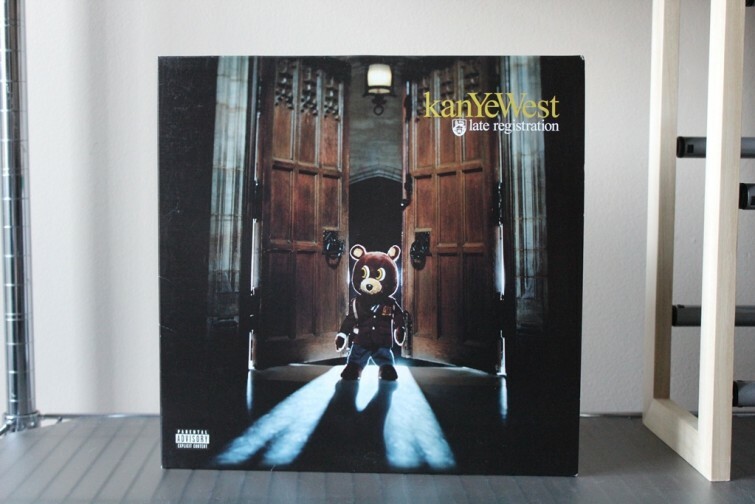 “Gold Digger” is a fan favorite that is thematically similar to “All Falls Down” from College Dropout. In this more fast-paced track, Kanye narrates two parallel story-lines– one wherein a wife manipulates her husband for financial gain and another narrative about a poor man who leaves his girlfriend when he makes it big. Kanye’s tongue-in-cheek sense of humor in “Gold Digger” showcases the artist’s peerless blend of social critique and humor. It’s poppy and sing/rap alongable with Jamie Foxx singing a sample of “I Got a Woman” by Ray Charles. But there’s also a surprisingly bit of substance about financial responsibility and the fickle nature of romantic loyalty. “Gone” is easily one of my favorite Kanye tracks to date. The track strung together by a sample of “It’s Too Late” by Otis Redding and contains ten violins, four violas and four cellos. It’s easy to imagine “Gone” being a great song even without vocals. The track builds masterfully and slowly, adding and subtracting instruments and drums throughout– not to mention Cam’ron and Consequence’s perfect additions. If you don’t like Kanye after listening to “Gone,” you probably never will. Kanye’s insistence on disregarding every hip hop cliche in the book is present in every line and every hook on his sophomore effort. From the lyrical complexity to the construction of the instruments and electronic sounds, “Late Registration” is a hip hop classic with enough musical power to make even skeptics buy into Kanye’s self-appointed hype.